Some university students receive so little tuition they pay the equivalent of £1,000 an hour for contact with academic staff, researchers say. On average, economics undergraduates receive the equivalent of just 26 hours of one-to-one teaching over a three-year course, research published by the journal Fiscal Studies suggests. Physics students receive almost three times as much for the same fees. "It seems a bit bizarre," report author Dr Mike Peacey told the BBC. "It certainly seems like humanities students are subsidising Stem [science, technology, engineering and maths] students," said Dr Peacey, an economics lecturer at the New College of the Humanities, in London. "Really, students are paying a kind of university tax rather than tuition fees. "Maybe that's what you want, but we should be a bit more upfront and honest about this." Many English universities now charge UK and EU students the maximum, £9,250 for the vast majority of undergraduate courses. Using Freedom of Information law, researchers from Bristol University and the New College of the Humanities obtained data from 67 UK universities. To compare teaching received, for example, by history students in small group tutorials with that received by physics students in a mixture of lectures, seminars and laboratories, they then came up with a measure - total equivalent adjusted contact hours (Teach) - to convert teaching time and class size into the equivalent number of hours of one-to-one contact. There were also wide variations within subjects. For example, economics students at the top 10% of universities received almost five times as much teaching as those in the lowest 10%. 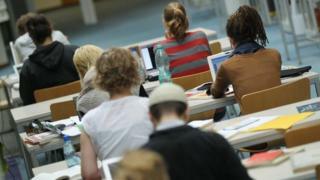 "How much students must pay in tuition fees makes no difference to how much teaching they receive," the report says. "Clearly, some students are receiving much better value for money than others. "For a market to function properly, participants must be able to compare what is offered by different providers." The authors suggest their Teach measure could inform the government's new Teaching Excellence Framework, which assesses teaching quality at UK universities by subject. Students studying Stem subjects have always had more contact hours, they add, and increasing the amount of teaching "may not be beneficial for all students - for example, if the cost of extra contact is lower teacher quality". "Even when quality is held constant, some students may be better off working on their own." Dr Peacey said: "Lots of people have suspected that there are cross-subsidies between subjects. "If physics students are receiving much more tuition than history students, it could be that both are paying more than the tuition costs but the physics students are being less ripped off than the history students. "I think if this measure got taken up and universities were asked to provide this information to students, it might be that different universities might offer differential rates for tuition. "Maybe universities offering more contact time would charge more in fees."